Factory Honda man Joan Barreda extended his lead in the overall Dakar standings with a brilliant day three performance that saw his secure his second stage win of the 2014 Dakar. Barreda’s outright speed is well known, but in the past he has been prone to mistakes with his committed riding also pushing his bike to the limit. But so far in 2014, the 30 year old Spaniard has been fast and smart and while the event remains in its infancy he enjoys a significant 13m 04s lead over the rest of the field. Second spot went to five time Dakar winner Cyril Despres who bounced back from his crash and lowly finish on stage two. The factory Yamaha rider knows there is still a long way to go, but his push to keep Barreda in touch shows just how serious he is taking the threat of the Spaniard. He said: "Today’s special has to go straight into the Top 5 most stunning specials I have done in 13 years of racing rallies – and in that time I’ve been to some pretty amazing places! As announced, the recent rains had really cut up the first part of the special and the riding was far from easy. Then at kilometre 299 we came to this incredible 3 kilometre climb. It was a really, really hard to get up and I can only begin to imagine how many riders will go out of the race at that point – and it’s not just the amateurs who are going to struggle. Then after that we rode for about 60 kilometres on stunning tracks over a series of mountain ridges, as beautiful as they were difficult to navigate. Towards the end I came up behind and past both David Casteu and Marc Coma. All in all an excellent day that more than makes up for yesterday’s disappointments." Three time Dakar winner, Marc Coma also upped his game on stage three having overcome the costly technical issues on stage two. The KTM man finished third and now holds third overall albeit 13m 56s behind race leader Barreda. After his brilliant stage two victory yesterday, Sam Sunderland has a disastrous stage three. Opening the track, the 24 old Brit made a navigational error which saw him get badly lost, ultimately losing close to 2½ hours to the leaders. He was however in good company with the newly crowned FIM Cross Country World Champion Paolo Goncalves also making the same mistake. Last years runner-up Ruben Faria is out of the race after crashing his factory KTM during today’s Special Stage. The Portuguese rider is conscious, but will take no further part in the race. 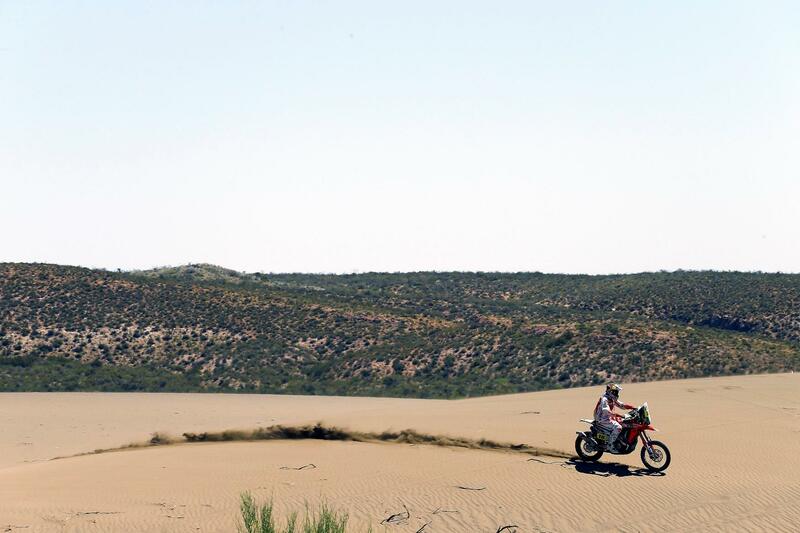 British rider Jamie Smith is also out of the Dakar. The event rookie had a collision with a quad on stage two which ended his rally and meant he had to be taken to hospital. He has now been discharged.